Campaign for the American Reader: Pg. 99: James Hudnut-Beumler's "Strangers and Friends at the Welcome Table"
Pg. 99: James Hudnut-Beumler's "Strangers and Friends at the Welcome Table"
Featured at the Page 99 Test: Strangers and Friends at the Welcome Table: Contemporary Christianities in the American South by James Hudnut-Beumler. 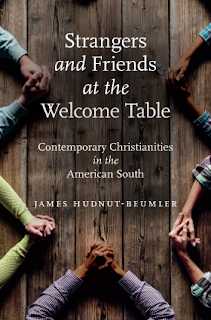 In this fresh and fascinating chronicle of Christianity in the contemporary South, historian and minister James Hudnut-Beumler draws on extensive interviews and his own personal journeys throughout the region over the past decade to present a comprehensive portrait of the South’s long-dominant religion. Hudnut-Beumler traveled to both rural and urban communities, listening to the faithful talk about their lives and beliefs. What he heard pushes hard against prevailing notions of southern Christianity as an evangelical Protestant monolith so predominant as to be unremarkable. True, outside of a few spots, no non-Christian group forms more than six-tenths of one percent of a state’s population in what Hudnut-Beumler calls the Now South. Drilling deeper, however, he discovers an unexpected, blossoming diversity in theology, practice, and outlook among southern Christians. He finds, alongside traditional Baptists, black and white, growing numbers of Christians exemplifying changes that no one could have predicted even just forty years ago, from congregations of LGBT-supportive evangelicals and Spanish-language church services to a Christian homeschooling movement so robust in some places that it may rival public education in terms of acceptance. He also finds sharp struggles and political divisions among those trying to reconcile such Christian values as morality and forgiveness—the aftermath of the mass shooting at Charleston’s Emanuel A.M.E. Church in 2015 forming just one example. This book makes clear that understanding the twenty-first-century South means recognizing many kinds of southern Christianities. The Page 99 Test: Strangers and Friends at the Welcome Table.